“The Jungle,” Wikipedia informs us, “is a play written by Joe Robertson and Joe Murphy, founders of the Good Chance Theatre Company, and directed by Stephen Daltry and Justin Martin.” It was first produced by London’s Young Vic theatre company to great success, then traveled to the West End for an equally successful run, and now arrives in San Francisco (thanks to the extraordinary Carole Shorenstein Hayes) on the stage of the Curran Theater. It is widely held to be one of the most important English speaking theatrical events of the decade, and its residency near Union Square is undoubtedly a Big F*ing Deal. What’s it all about? To get a grip, we need to consider a bit of history. From the French port of Calais, it is possible to look across the English Channel to the white cliffs of Dover, just 35 miles away, in South East England. Travellers have entered England from Calais, crossing the Channel, since the days of the Roman Empire. More recently, travellers could take the Calais-Dover Ferry to cross the Channel, or, if they had the money, hop across in small aircraft. Since 1994, it is possible to make the crossing by train, car, or truck through an underwater tunnel (the Chunnel), making it easier than ever before. Moselm refugees in “The Jungle” pray while surrounded by the audience at The Curran Theater. The community lasted for a year, through October of 2016. In that time, residents built shelters and hunkered down while authorities used every legal and illegal means at their disposal to force them out. There were riots and tragic deaths, and ultimately the area was cleared and the refugees dispersed. In the play, one character, before the eviction, announces that: “Kids will disappear, hundreds of them.” This was met with an audible gasp from the audience, as we realized that similar stories are playing out here in the United States, today, not just a few years ago in Calais. Refugees came to Calais in the hopes of successfully fleeing across the Channel to England, by any means they could find, often getting across as stow aways on trucks or finding a sympathetic person to smuggle them. On any given night, rumors would abound that this night one might find “a good chance” to get across (or not). When you arrive at The Curran for this production you enter a completely transformed space. It is a convincing recreation of a part of the refugee camp, dirt floor and all. You are seated at benches in a refugee’s restaurant and even served food and drink. The action takes place all around you, often being played upon the long restaurant tables. Additional audience members are seated in the mezzanine looking down on the action as if in an arena. It is not complete immersion, as we are constantly reminded that these are actors retelling true stories that they want to share, but there are moments we forget. Many stories are told, and the ensemble is polished and professional. We follow the efforts of an Afghan man to establish a successful restaurant right in the middle of the camp. We get to know a teenager who tries every night to get to London, and a little girl cared for by a volunteer from the UK. One young man from the UK, still a teenager, obviously a child of privilege, is designing and building housing, an entire development. Tommy Letts, making his professional debut after training at London’s Royal Central School, is excellent, as is the entire cast. Another actor making his professional debut is Khalad Zahabi as Norullah, the always optimistic and enthusiastic young man who tries every night to flee to the UK. And they offer an incredible night of theatre. Meanwhile, across our own channel (San Francisco Bay) in Oakland, members of the Ubuntu Theatre Project are recreating an only slightly different sort of refugee camp—a homeless encampment set in a garage in Oakland. The stories are different and also achingly the same. The performances equal those of “The Jungle” in passion, commitment, and execution. To see both plays in the course of a week, as I did, is a revelation. “Down Here Below” is, also, an incredible night of theatre. 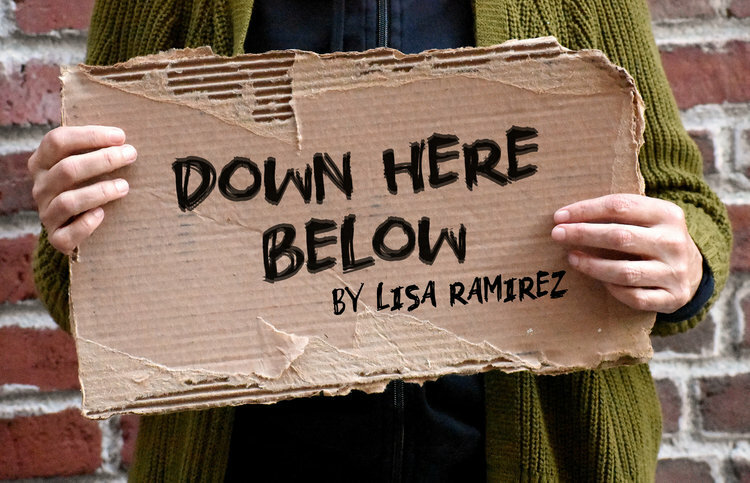 “Down Here Below” by Lisa Ramirez is billed as an adaptation of Maxim Gorky’s “The Lower Depths,” one of the classics of Russian realism, set in a homeless shelter. Ramirez’s version follows the story loosely, and, like Gorky, focusses more on character than story. And what characters! We meet them as we enter the garage, standing about and either panhandling the audience or muttering to themselves. The misery is palpable. As with “The Jungle, the environment is immersive. But here, it hasn’t been necessary to disguise a luxurious Broadway style theatre. Instead, it is simply the concrete of The Flax Building garage on MLK Jr., the cars gone and the walls decorated with graffiti. It could easily be what it purports to be, a place for a group of homeless refugees from god-knows-what to try to make a home. In “The Jungle” several refugees hand out homemade pamphlets to the audience calling for an Emergency Meeting in response to a pending eviction attempt. In “Down Here Below,” a homeless hopeful rap performer hands out flyers for an upcoming performance at an underground club. The feeling is similar. Life continues under the most desperate of circumstances. Like “The Jungle,” “Down Here Below,” is, above all else, an ensemble piece, though with twenty actors instead of “The Jungle’s” eighteen. Not a big difference. In both cases, the small company creates the feel of a much larger community. Among the memorable characters in “Down Here Below,” actor J Jhan stands out as the transgender Zig-Zag, fighting for their dignity after being disrespected while attempting to purchase food from a taco truck. J Jhan’s performance rings with absolute emotional truth. The experience of being a refugee, is perhaps, the zeitgeist of our time for far too many, whether one is a disenfranchised voter in Georgia, a migrant parent at the Texas border fleeing violence at home to save your toddlers, a young Democratic Socialist fearing the coming climate disasters, a homeless evictee on the streets of Oakland or San Francisco, a desperate opiate addict in rural Kentucky, an uninsured patient facing a cancer diagnosis, a transgendered teen thrown out of the family home, an urban middle school student at a school where both a large number of teachers and students alike are found to suffer symptoms of PTSD due to the stresses of poverty, desperation, and, often, fear of deportation and the breakup of families—this dreary litany of woes could be endless. In “The Jungle, ” one actor/character observes: “If you open me up when I’m dead, you will find Calais engraved on my heart.” The theatrical intensity is such that you believe him: actor and character are one. “The Jungle” continues at The Curran in San Francisco through May 19, 2019. For further information, click here. Ticket Prices: $25-$165. “Down Here Below” continues at The FLAX Building in Oakland through April 28. For further information, click here. Ticket Prices: $15-45 (or purchase a pay-what-you-can season subscription). “The Jungle” by Joe Murphy and Joe Robertson. This production by The Good Chance Theatre, National Theatre, and Young Vic is presented by Sonia Friedman Productions and Tom Kirdahy. Directors: Stephen Daldry and Justin Martin. Set Design: Miriam Buether. Costume Design: Catherine Kodicek. Lighting Design: Jon Clark. Sound Design: Paul Arditti. Video Design: Duncan McLean and Tristan Shepherd. Moe Bar-El, Lorraine Bruce, Alexander Devrient, Trevor Fox, Ammar Haj Ahmad, Tommy Letts, Catherine Luedtke, Yasin Moradi, Jonathan Nyati, John Pfumojena, Zara Rasti, Rachel Redford, Ibrahim Renno, Dominic Rowan, Rachid Sabitri, Mohamed Sarrar, Moses M. Sesay, Eric Tabach, Milan Tajmiri, Bisserat Teggai, Ben Turner, Nahel Tzegai, Tim Wright, Khaled Zahabi. “Down Here Below” by Lia Ramirez, adapted from “The Lower Depths” by Maxim Gorky. Director: Michael French. Lighting Designer: Stephanie Ann Johnson. Sound Designer: Christopher Sauceda. Costume Designer: Anabelle Ejem. Set Designer: James McSweeney. Graffiti Artists: James McSweeney, Ruben Ramirez, Jose Diaz, Jerry Macalino. Michael Aldrete, Olivia Ball, Rolanda D. Bell, Jean Cary, Kimberly Daniels, Abdulrahim Harara, Champagne Hughes, Indigo Jackson, J Jha, Guillermo Labarca, Dorian Lockett, John Mercer, Alf Muller, William Oliver III, Arielle Powell, Kevin Rebultan, Kevin Rebultan, Leo Shaffer, Matt Standley, Lucy Urbano, Margherita Ventura. 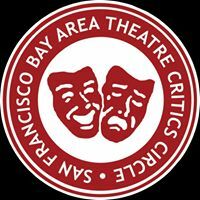 Posted in Reviews.Tagged bay area san francisco theater reviews, Charles Kruger, Curran Theater, Down Here Below, Good Chance Theatre, Joe Murphy, Joe Robertson, Lisa Ramirez, National Theatre, The Jungle, theatrestorm, Ubuntu Theater Project, Young Vic.